This is a Celtic triskele pendant. The pendant is made from treated stainless steel and is 1.5″ tall. It is on an 18″ long black leather cord. Items on backorder take about 3 weeks to arrive. This is a Celtic triskele pendant. The pendant is made from treated stainless steel and is 1.5″ tall. To learn more about the material the pendant is made from, click here. It is on an 18 inch black leather cord. The meaning of the Triskele (or triskelion) symbol is different in different cultures and contexts. Some of the earliest examples are at ancient sites in Ireland. Some believe it could be a way to symbolize the concept of infinity, since it has been found at tombs in Ireland. One notable example is at the Newgrange passage tomb. This symbol pre-dates Christianity in Ireland, but has been used by Christians there, too. Because it features three spirals, Christians used it as another symbol for the Holy Trinity, similar to thetriquetra knot. The triskele has also been used by many other cultures over the years, and has a very different meaning in many of those. The three sets of spirals have been shown as legs, and shown as “running” legs. 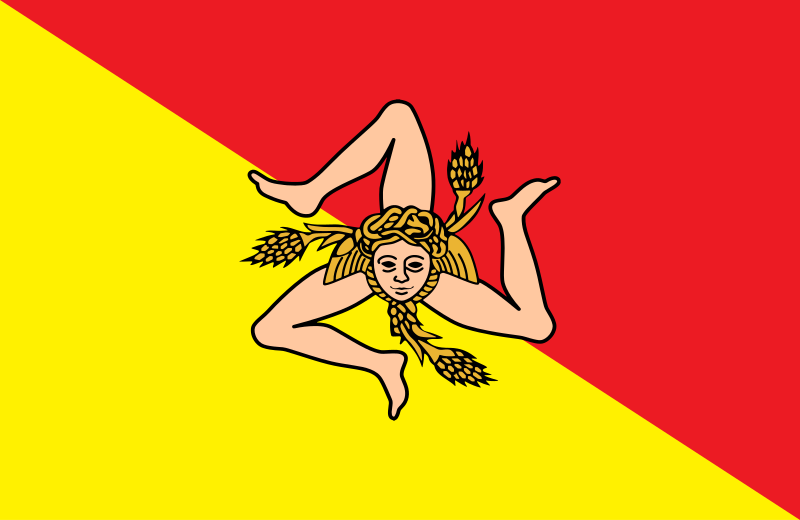 For example, see the flag of Sicily. In this context, the triskele symbol is believed to mean action, progress, or moving forward. The United States Department of Transportation uses a triskelion as their logo. Another modern interpretation is that is symbolizes and type of “trinity”, such as “mind, body, spirit”, or “past, present, future”. There are several variations on the triskele pendant symbol or triple spiral. Some have the triangle in the center and some do not. Others have elements that wrap around the outside of the symbol and make a circle. Click here for my full blog post on the subject.